Matt, You remember my favorite Christmas song, John Lennon’s “So This Is Christmas And What Have You Done”. Those words always made me stop and think about what I had done with the gift of the year I’d been given. I would examine my behavior and think about the things I did and all the other things I wanted to do but put on the back burner for another time. Alway under the incredibly naive assumption that I was in control and there would always be more time. I heard the song on Pandora today and I had to sit and catch my breath. Thinking back to another year leading up to Christmas without you. So this is Christmas and what have I done? Another year older and a new one just begun. This year those words hit me as I felt that now familiar wave of grief slap against my hurting heart. This year I became older but you remained 37. This year I lived with a grief so powerful that many times I had to force myself to breathe. This year as I looked back my soul fills with regret. Things I wanted to do with you and say to you left undone. Thought that there would always be a tomorrow dance through my brain. There will be no new year for us. No my sweet boy. No happy Christmas. No happy New Year. So this is Christmas and what have I learned? I’ve learned that the pain of losing a child crushes your soul. Changing you from the very core of your being. The loss is indescribable, heart obliterating, life altering. The pain lives in every breath and step I take. This pain is invisible to others, but excruciating to me. This pain has become a part of who I am. It will remain an ever present ache with every passing moment until my last breath. I’ve learned that grief has no stages. Grief has a mind of its own. Hitting so powerfully at unexpected times. There is no rhyme, reason or warning as to when and where it will strike. I’ve learned not to fight when those waves hit. I’ve learned to let grief wash over my soul until it recedes. I’ve learned grief doesn’t keep track of how long it’s been……. I’ve learned how brutal the second year truly is when the fog has lifted and reality comes home to stay. Never believing that any pain could be worse than that heartbreak of all the firsts. The second has been brutal. Kicking me to the curb slicing open my broken heart with every memory of a life that used to be. Leaving my heart battered and bloody. I’ve learned that shock never subsides. I’m shocked with every punch of reality. You are really gone. There is no pretending this year. 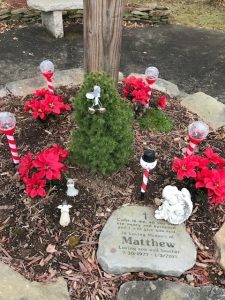 My heart knows you will never be home for Christmas. As the holidays approach pieces of me shatter to the ground. I’ve learned that normal died the day you did. Leaving me alone to navigate life as a bereaved parent. For the rest of my life, I have to learn how to survive the pain. This excruciating torture cannot be described in human language. My grief over shadows joyful moments as I realize our life is permanently divided into before and after your death. How I think and feel have been severely altered. I have been taught the ultimate lesson. We are promised nothing. Not tomorrow, not months, nothing. I no longer sweat the small stuff. I’ve learned to hide behind my mask and move on. Accepting that people are uncomfortable with grief. I carry my elephant and play the game of surviving around those who could never imagine life after child loss. I’ve learned that expectations lead to further heartbreak. So this is Christmas and what have I done? Since your death, I have lived the experience of Gods power in my life. He closed the door of your addiction and opened a door of understanding and compassion for others. Out of my brokenness, A Hug From Matt was born. Your life taught me to see past the shell of a person by being able to look into their soul. I honor your life by ministering to those who are addicted and homeless. I feel your presence in their smiles and hugs. Bringing joy to those the world forgot brings peace and joy to my heart. I have found the words to share our story with the world. To shatter the ugly stigma that follows those who suffer from your disease. Words that touch another parents heart. Words that bring help and hope to those who share our story. From my grief a new person has emerged. I am fearless. An advocate for change in the treatment of Addiction. I have surrounded myself with parents who get it. The broken ones. Parents who were once strangers now hold a piece of my heart. We encourage each other and cry together as we crawl through the days that many would never survive. Knowing that until one experiences this loss it is almost impossible to express. We have a permanent bond. The bond that only a bereaved parent would understand. Your death has impacted my life in ways I would have never imagined. Time now allows me to stop and smell those roses I once ran by. My faith is deeper. Prayers are no longer recited from memory instead they come directly from my heart. I appreciate every moment I spend with those I love. I take nothing for granted knowing that in one breath the world can be changed forever. So this is Christmas. Another without you. This year I can reflect on the beauty that came out of the ugliness of your untimely death. I can reflect on what I have done to honor your life. This Christmas I will remember your smile. I will feel you in the hug from your brother. 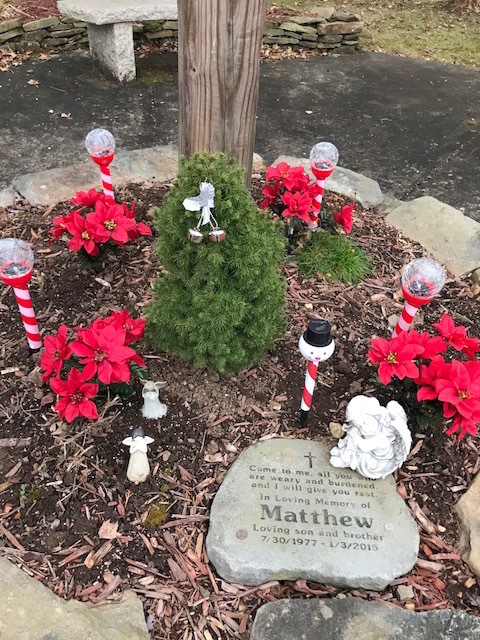 This Christmas you will live on through me forever……..
Matt, December 3rd marked the 35th month since your death. 35 months. I still can’t believe you are really gone. I heard the second year was tougher than the first. Never in a million years could I ever allow my mind to believe it to be true. It seems the protective fog has blown out to sea leaving me a clear view of the empty shoreline. This second year has beat me to the ground. My cocoon shredded and blown away with the wind. My mind reminds me daily that you are dead. I feel naked, stripped of the protection that the shock of grief provided during those first months when my mind was in complete denial. Grief protects you from reality. The brain builds that impenetrable wall able to withstand the assault of reality. The second year, cracks begin to form and the wall slowly begins to crumble at your feet. Leaving you with a clear view of life. Last year I was numb. Able to go through the motions of life. My holiday mask was intact and firmly secured to my face as I navigated my way through the usual festivities. My mind allowed me the fantasy that you were alive. Living in Florida. My mind allowed my heart to stay on track providing multiple distractions keeping the grief under wraps in public. This year I’ve found the mask has dissolved from the flow of my tears. This year my grief has gained power. This year my grief doesn’t seem to care that this is the happiest time of the year. Your loss continues to stun me. I’m shocked when reality slaps me with the knowledge that you won’t be coming home for Christmas when I hear that holiday song. Reality grabs my heart and causes me to forget to breathe. I was told in time I would get angry. I’M ANGRY. I’m angry at our reality. I’m angry at happy strangers shopping with a spring in their step and joy on their faces. I’m angry that my grief continues to hurt so deeply. I’m angry that I’ve just survived Thanksgiving and Christmas is being shoved down my throat. Not everyone is merrily anticipating holiday traditions. For some of us our holidays will never be the same. I’m angry that the woman I see in the mirror is not who I used to be. This second year has a power I could have never anticipated. My mind now clear vividly remembers painful events. My guilt has returned full force. My double whammy. Grief and guilt have renewed their friendship bullying me every chance they get. My mind remembers things it buried to protect my shattered heart. Things said and done during your addiction. The I should haves or could haves haunt me like ghosts from Christmas past. I look at family pictures. 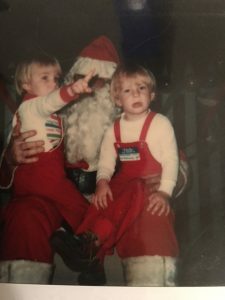 You and Mike on Santa’s lap. Childhood innocence. A time of joy and anticipation of things to come. Never did I see this coming. Never did I ever think my youngest son would be gone in the blink of an eye. I hear strangers stating what they want for Christmas. Children rattle off a list of toys. Adults want more money, a better job or world peace. I cringe and feel the tears start to form. The song, “All I Want For Christmas Is You”, starts playing in my head. I close my eyes squeezing as hard as I can. Trying desperately to balance myself on the edge of my abyss. I want a visit from the ghost of Christmas past. I want to see my boys squeal with delight as they rip into beautifully wrapped gifts. I want to hear the laughter of two boys as they compare super hero capes. I want to feel the joy and completeness of having my family intact. I want to travel back in time. Before you became adults. Before your injury led you down the path of no return. I want to fix what is broken. I want to close my eyes and see you walk in my door. I want to hear “Hey Mom, Merry Christmas”. As your wife and kids wrap me in a hug. I want to see you and Mike standing side by side belly laughing as a childhood memory cracks you up. I want every chair at the table full. I want to raise a glass and toast to a future full of possibilities. Unfortunately, A Christmas Carol is just that. A fantasy script written long ago addressing second chances. Our reality is a painful reminder that death doesn’t give a redo. There will be no second chances for us. No more watching you and Mike standing together surrounded by your family. No more holiday pictures full of smiles and joy. No more hearing a Christmas song without the punch of grief taking my breath away. This year when everyone else is dreaming of a White Christmas, I’ll be dreaming of the family we used to be…….